The Landings Resort & Spa by Elegant Hotels is a unique and exclusive Caribbean hideaway, set in a beautiful beachfront location in St Lucia’s Rodney Bay. Now part of the Elegant Hotels group, the hotel combines five star luxury and newly renovated accommodation with fine dining and true Caribbean hospitality. The Landings is ideal for couples, groups and families, offering 85 suites with large verandahs overlooking the marina or the ocean. Certain suites also feature private plunge pools which are perfect for enjoying a sunset cocktail. The Landings has three restaurants and two bars, offering guests the choice between bed and breakfast, half board and all-inclusive. The Palms is a stylish restaurant overlooking the marina, serving a range of fresh fish and meat prepared on a lava stone grill for dinner. Breakfast, lunch and dinner is offered at The Beach Club with its range of grills, lighter bites alongside a full bar, while authentic Caribbean cuisine is served up at Callaloo. For something special, guests can arrange for one of the chefs to cook a meal of their choosing to be served privately in their suite. On the other hand, nearby Rodney Bay offers a range of dining options, bars and evening entertainment too. In addition to a beach that is perfect for swimming, The Landings has three swimming pools, a tennis court, children’s club, a fitness centre and a variety of non motorised watersports. The Soleil Spa offers a comprehensive range of spa treatments while the St Lucia Golf Club is just five minutes away for any keen golfer. Children are well catered for at The Landings with a complimentary children’s club running daily and offering a range of activities for the younger guests. Children can expect sunshine-filled days packed with sports, crafts and adventure. Various attractions are found within easy reach of the hotel, such as the Pigeon Island National Park and Castries, the capital of St Lucia. Slightly further away are places of interest including the Sulphur Springs and the Diamond Botanical Gardens, easily accessible when renting a car or hiring a driver for the day. For the more adventurous of travellers, days can be spent zip lining through the tree canopy in the rainforest, sailing or exploring the extensive marine life on a scuba dive. The Landings is a great resort which is perfect for families or groups travelling together who like the idea of being resort based, but also want the independence of a spacious apartment with self-catering facilities. The accommodation is spacious, well equipped and luxurious and I was particularly impressed that every bedroom in each apartment has it's own bathroom - great for privacy when travelling with friends. Offering a great selection of facilities on site, including 3 restaurants, a kids club, a selection of water sports and more, it really does tick all the boxes. The spa and gym are also very well equipped, offering a range of classes including yoga and aqua aerobics along with 8 treatments rooms offering a wide range of treatments. Located on a really lovely beach, you have easy access to Rodney Bay and Castries so it's a great place to get out and explore the area. We particularly enjoyed the dining on offer at the Beach Club, and the live music was a great accompaniment. Perfect for those looking to have flexibility between a hotel and a villa, I think the Landings really does have it all! 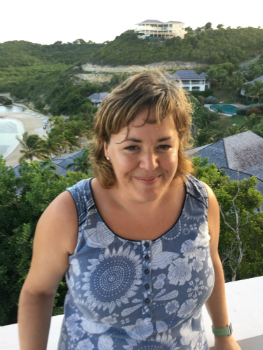 For more information about The Landings or alternative resorts, take a look at Karen's St Lucia Trip Diary. Children: Children are welcome all year round at The Landings and all children up to the age of 11 stay free of charge when sharing with an adult. The Landings offer a complimentary children’s club where children can enjoy excursions, activities and sports. Babysitting is also available and is charged locally. Distance from the airport: Approximately one hour and 30 minutes' drive from Hewanorra International Airport. To get there in style, helicopter transfers are also available between Hewanorra International Airport and George F.L Charles Airport, taking approximately 10 minutes plus a drive of about 20 minutes between the airport and the resort. Helicopter transfers cost around £150 each way - ask our Caribbean specialists for more information. Complimentary Facilities: Three swimming pools, two hot tubs, a tennis court, non motorised watersports, complimentary shuttle transfer to Rodney Bay village, Wi-Fi, the manager’s cocktail party, a full fitness centre and the children’s club. Other facilities: There is an onsite spa and golf is available at the nearby St Lucia Golf and Country Club. The hotel’s concierge team will be happy to arrange any car rental, excursions or tours. These are chargeable locally. Meal Arrangements: B&B, half board and all-inclusive options are available. Dining: There are three restaurants at the resort. The Beach Club serves breakfast, lunch and dinner; The Callaloo serves authentic Caribbean cuisine at lunchtime and The Palms Restaurant offers fine cuisine in the evenings (closed on Mondays). You can also arrange for a private meal in your suite cooked by one of The Landing’s chefs. There is a choice of three bars around the resort serving a range of cocktails, wines, beers and soft drinks. All the villas have a full kitchen, a large living area, one, two or three bedrooms, a TV, DVD player, Wi-Fi, air conditioning, a washing machine & dryer, a hair dryer and a spacious terrace. Suites are split into three categories: Marina View, Ocean View and Beachfront. Marina View Villa Suites as well as two- and three-bedroom Ocean View and Beachfront Villa Suites are available with a plunge pool. Guests staying in many of the Ocean View and Beachfront Villa Suites can take advantage of a butler service who is on hand to serve lunch, deal with special requests and arrange dining experiences.